The lifters needed to be equipped to handle two different cylinder sizes. Bushman engineers custom-designed the units with two sets of gripping legs. 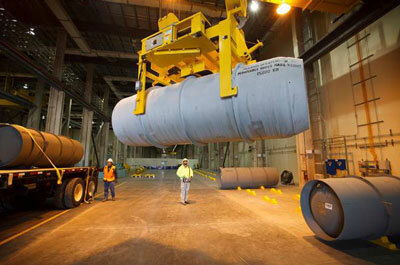 One set grabs from the sides of the larger cylinder—weighing 44,000 and measuring 48” in diameter and 146” in length. The other set of legs grabs from the ends of a much smaller cylinder—weighing 9,000 pounds and measuring 30” in diameter and 81” in length. “Incorporating the two functions in one lifter was the key to delivering efficient operation,” noted American Crane project manager Troy Wetzel. A harsh environment also presented another engineering challenge because one of the lifters is being used in a very hot, dry, and dusty location in the Southwestern U.S., it had to be sealed extremely well to protect the drive components. Special materials and coatings were used in order to eliminate the use of grease.